In early January, I ordered a bunch of luxury candles from one of my new favorite candle shopping sites, ScentsandSprays.com. I love their site. They have a great selection of all the popular high-end brands that I want to review for CandleFind like The Thymes, Illume, Trapp, Archipelago and a lot more. I find myself ooo-ing and aahh-ing over all the cool stuff on their site. (If you’re a die-hard candle lover, you might want to check it out.) You have to loosen the purse strings a little to buy some of the high-end candles on Scents and Sprays, but a little luxury pampering every once in a while never hurts a gal, right? olate candle collection called Au Chocolat. If you love chocolate as much as I do, this collection may be just what your sweet tooth needs…that’s if you’re willing to pay $28 for a medium size candle. I know…call me crazy, but I want to review all types of candle brands out there, not just the cheapies. Scents and Sprays does offer free shipping for orders over $99, so that did help a little. The Thymes produces fragrant luxury candles and bath and body products. They seem to be pretty popular because I’ve seen them for sale everywhere online. I’ve known about this company for a couple years but never really had the nerve to spend the money for one of their candles until now. I guess my curiosity got the best of me… and my wallet. What does my Thymes Chocolat Mandarin candle look like? It looks cool! One of the things I like about The Thymes that sets them apart from most other candle companies is their uniquely designed packages. Each candle from The Thymes comes in a stylish box featuring orginial works of art by their founder Leslie Ross Lentz. Leslie creates each design to capture the inspiration behind each candle collection. 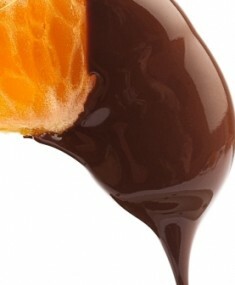 My Chocolat Mandarin candle is SO modern and goes right along the whole chocolate theme. The box is a dark chocolate color with bright orange accents. Check out the photo above to see it. The actual glass container of my candle is clear with the kind of thin chocolate ribbons or swirls that chefs use to garnish a desert plate… very cool. All of the candles in the Au Chocolat collection have the same modern container. I always like getting candles packaged in stylish boxes versus candles just wrapped in bubble wrap. Sometimes the presentation of something is key to winning me over. I love design and seeing how a company can pull together a snazzy theme around a fragrance. It makes me feel like a kid on Christmas morning when I open a candle package like this! How did my Chocolat Mandarin candle from The Thymes smell? When I first lit this candle and the scent filled the room, I couldn’t figure out what I was smelling. The scent was kind of chocolatey, but the chocolate part to this scent that stood out the most was definitely not a pure milk or dark chocolate smell. I kept saying to my hubbie, this scent smells so familiar. I know I’ve smelled this smell before but I can’t figure out what it is. My inquiring sniffing went on for a couple of days. Then one day I had this candle burning in my bathroom and walked by the room in the hallway. I think I had my mind on something else because I wasn’t really thinking about the candle. All of a sudden, it hit me! This candle smells exactly like Tootsie Rolls! I was so happy to finally figure it out. I’ve never been a big fan of Tootsie Rolls. I prefer the pure chocolate taste of my sinful treats, but if you like Tootsie Rolls, you will LOVE this candle. Bittersweet chocolate, animated with the bright and clarifying zest of mandarin orange, sweet orange blossoms, neroli and a golden drop of honey. Inhale, for instant gratification. d it and found out that it’s a delicate floral scent with a warm, fresh citrus quality to it. Sorry Thymes, but I just can’t pick up the orange part to this fragrance. For my nose at least, I think I’ll rename this candle Tootsie Roll. There’s one more thing I want to note about this scent before I wrap up this part of the review. This fragrance has a very elegant and smooth feel to it that’s hard for me to put into words. I think if you try it though, you’ll know just what I’m talking about. This candle is like the exact opposite compared to the type of candles you’d find in stores like Walmart or Target. I hope that helps to explain what I mean. After experiencing this candle, I can really tell The Thymes put a lot of time and thought into this scent. I expect that their other candles have the same high level of quality. I’m dying to try some of their other scents now…especially the other chocolate ones in this Au Chocolat collection. How did my Thymes candle burn? My candle burned evenly and clean. No soot at all left on the glass container…it remained clear as a bell even when the wax was right down toward the bottom. Even though I’ve only tried this one candle from The Thymes, I can see why they are considered part of the elite class of candles and cost a little more. If all their other candles live up to the quality of my Chocolat Mandarin candle, which I expect them to, no wonder why The Thymes is a popular brand. I am VERY impressed by this company and couldn’t think of one thing they could do to improve this candle. The packaging is SO stylish and goes right along with the chocolate theme of the candle, the scent of this candle is fabulous and the scent strength is WOW! If you’re going to get into some serious pampering by splurging on a Thymes candle, I recommend you shop at the candle store where I bought my candle, ScentsandSprays.com. I think you’ll be just as happy as I am with their selection and service. And, to help out your pocketbook, shipping is free over $99. You can buy directly from The Thymes web site too. The prices are the same from what I can see between Scents and Sprays and Thymes.com, but it looks like you’d have to pay shipping on your order from the official Thymes site. If you shop at Scents and Sprays, you can pick up another luxury candle brand to try too… my favorite part! Enjoy! Scent description for Chocolat Mandarin - Bittersweet chocolate, animated with the bright and clarifying zest of mandarin orange, sweet orange blossoms, neroli and a golden drop of honey. Inhale, for instant gratification.